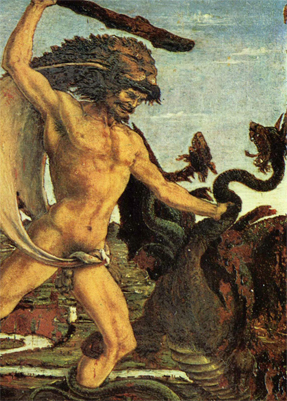 Detail from Hercules and the Hydra, by Antonio Pollaiuolo, c. 1475. Sooner or later, seekers on the spiritual path will have to “do battle” with their own inner desires. The myth of the Hydra symbolises this struggle, and it is the spiritual path of Scorpio. Scorpio is not afraid to do battle, to go deep into the darkest depths of the human psyche and bring whatever is there into the light of awareness for healing. This is why the sign of Scorpio is associated with both priests and psychologists. A dominant theme in this internal battle is our struggle with desire. Most fundamentally these desires can be separated into painful desire and skillful desire, both aspects stemming from a neutral energy called the Will to Do. Painful desire involves greed, grasping, inadequacy, and longing. Skillful desire is born of this same Will to Do but directed by love, vitality, compassion, creativity and wisdom. With the development of awareness, we begin to distinguish unhealthy desire from skillful motivation. We can sense which states are free from unskillful desire and enjoy a more spontaneous and natural way of being without struggle or ambition. Having developed discernment in Virgo, and balance in Libra, our Soul is ready to “do battle” in Scorpio. In Esoteric Astrology, Alice Bailey refers to the “crucifixion of the personality” in Scorpio. It is the final battle (The first happens in Leo) and Scorpio is the last of the four “signs of crisis or challenge.” It is a kind of birth, for once the internal struggle in Scorpio is over, we have a clear pathway for spiritual progress. The key to winning this “battle” lies in Scorpio’s ability to find the point of light in the darkness. This hints at the victory. The true victory lies not in battling our desires, but in the power of acceptance – by accepting and embracing our darkest nature, our own shadow. Scorpio wins the battle, precisely because of her ability to look into the darkness without fear and bring loving acceptance to whatever is there. We are told that once the battle has been won in Scorpio, then the spiritual disciple can “see the goal” in Sagittarius. It is said that true liberation of the mind happens in Sagittarius. We are entering a time of great opportunity, where what we think and feel matters. This gateway of opportunity is marked by Ophiuchus the snake handler. This is symbolic for the point at which humankind collectively tames the “serpent” of our desires. It is time to stop chasing after outer desires, and turn our attention within. In doing so, we will collectively cultivate the state of mind necessary to allow a quantum leap in consciousness. It is said that the arrow of Sagittarius points at the center of our galaxy. In his book Galactic Alignment, Mayan cosmologist John Major Jenkins points out that on Dec. 21, 2012, the solstice Sun will come into alignment with the Galactic Center of the Milky Way, which lies in the gap between Scorpio and Sagittarius, indicated by Ophiuchus and the Archer’s arrow. The spiritual “goal,” which Sagittarius can see only after the battle has been won in Scorpio, is the Center: Source. On Dec. 21, 2012, maybe we have an important appointment with our inner selves. We have been sleeping as this cosmic clock has been ticking. Ophiuchus is telling us that the alarm has gone off and it is time to wake up. We are not passive “victims” in this process. The “apocalyptic annihilation” that so many fear for 2012 is really the end of a state of mind. ** It is the symbolic death of our painful desire-mind that allows a heart-opening to awaken us to Higher Mind and our highest spiritual potential. We are indeed living in interesting times, and everyone matters. It has been described as a time of purification – not because anybody is punishing us, but because we finally wake up and grow up. The year 2012 is a beginning, a birth. In the evolution of consciousness, this time marks the point of our collective awakening, taking the inner journey together and living the truth of who we are. We cannot open our hearts and be aware of our Soul’s journey while we are chasing after things outside of us, like a dog chasing its tail. When we turn our attention inward and focus on what matters, we can cultivate a “good heart” and transform unhealthy energy and desire into “skillful motivation.” Then we will see the spiritual goal that Sagittarius points at. On this cosmic journey, Ophiuchus just dropped in to say “hi” and to remind us that it is time now to stop and go within. Tame the serpent and prepare for our collective journey within, to our Creative Source. **The word “Apocalypse” comes from the Greek “apokálypsis,” meaning “lifting of the veil.” As the veil is lifted we see with new eyes the truth of our Being: Divine Oneness. Self-serving desire naturally falls away as our hearts open wide with compassion for one another, as we recognise our Selves in each other. Wikipedia has an excellent article on the history and meaning of the word. You an also refer to an article written by Pat some time ago, which is part of her archives. This entry was posted in About astrology, Guest Posts and tagged Alice Bailey, Galactic Core, Ophiuchus, Sagittarius, Scorpio, soul astrology on February 12, 2011 by Pat.